← Yeah, Sellwood Bee! Thanks! Last week in the garden was an inspiration. I have to say, putting together a community garden is pretty hard work. For anyone out there thinking of attempting such a thing, first of all, you should –of course, but be prepared to have your administrative skills, your people talents as well as your muscles put to the test. What makes it all worth it for me is seeing a change and seeing my neighbors become involved. 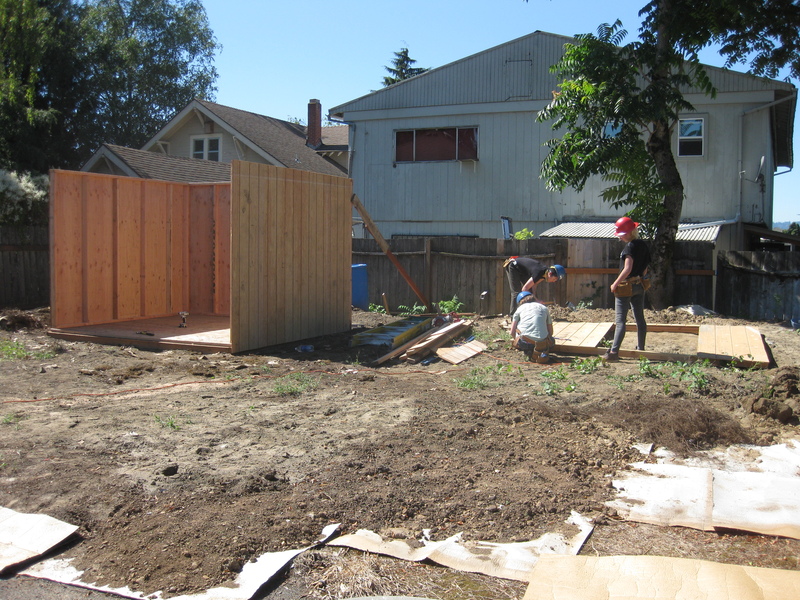 It was my great pleasure, once again, to be adjacent to the Oregon Tradeswomen as they build us a shed. This is a beauty of a shed. Everyone that sees it says “It’s way nicer than I thought it would be”. It is pretty deluxe. By the end of this past week three walls were up on the 10×10 structure, a fourth lay on the ground and the doors were built (beautiful little reclaimed wood picket doors-I’ll always remember asking that neighbor to give the garden his old wood instead of dropping the pickets off at the neighborhood clean-up-that wood is going a long way for us). The shed floor is cedar planking so it will last a long time. The roof will be galvanized metal donated by the Rebuilding Center. The whole thing is getting an adorable mint green paint job. Mr. Pywood and A-Boy gave us a discount on some of our hardware odds and ends. A-Boy also donated 2 flats of lovely geraniums and herbs which I managed to get potted up right away, thankfully. Lily Day Café brought down some incredibly delicious berry bars to lift the girls spirits and blood sugar! We missed foreman Katie who was out with a busted ankle but Foreman Holly jumped right in and the work went on. It has been really great to see neighborhood businesses take an interest in this project. I also had the opportunity to meet Bob Dinges of Giving Vegetable Gardens Charity this past week. We met randomly on Rhone St., as we watched that apparently busted water pipe doing it’s thing (scary). I was lamenting that the garden needs 8000 gallons of water to run each year and in the months that that pipe has been busted, I know many times that much has just run down the drain. We got to talking and, check out what he’s doing, there may be a really great relationship here. I would also like to thank neighbor Elaine for giving us the pick of the pile as she remodels her yard. We were able to get a few nice pieces of lumber. We also purchased a galvanized water tub off of Craigslist that will hold 390 gallons of rainwater from the neighbor’s roof. A screen and wire mesh top will get this functional in the next few weeks. We are hoping to be able to collect this over the winter and use it for watering some of our non-edible landscaping next Spring. I’m thinking of having 2 hour work parties every Saturday and Sunday from 10-12 for Fall and Winter-as I am able. If anyone has any input on that, now would be a good time to let me know. Also, I’m still looking for people to be part of a garden committee. I’d really like to know that there are a few devoted souls out there that I can call on and who I know will be in the dirt with us on a fairly regular basis. Please contact me if that is you…62ndgarden@gamil.com and as always, keep watching the changes!